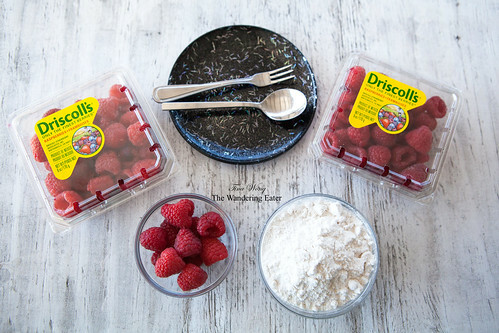 Recently, Driscoll’s was generous to send me some of their wonderfully sweet-tart raspberries for me to bake with. Inspired this weekend for the spring-like weather we were finally having in New York City, I wanted to bake something “happy,” if that make any sense. For me, one of my happy memories was when I was in Paris several years ago and brought my ravenous carb and sweet tooth, saw and ate my way through the city. One particular pastry that stuck in my mind that looked elegant and feminine when I passed by a few patisseries, which I found out was called the religieuse. Religieuse means “nun” in French, and by most accounts this pastry takes its name from a resemblance, however oblique, to a nun in a habit. The religieuse is constructed of two pâte à choux pastry cases filled with crème pâtissière (a type of pastry cream), a large one on the bottom and a smaller one on top, traditionally iced with a shiny chocolate or any flavored nappage and joined together with buttercream. 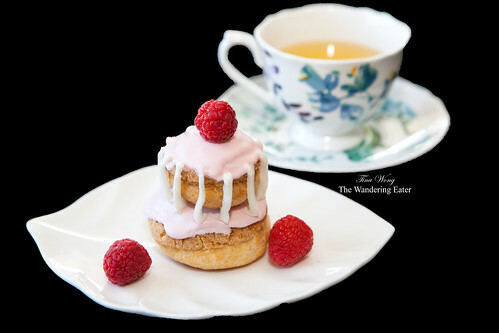 I changed the choux pastry by topping it with a delicately crunchy cookie topping (I love texture), made two types of pouring fondant (raspberry and unflavored) instead, and obviously flavored the pastry cream with raspberries. I know fondant tends to harden to a matte finish than the glossy wet look most are familiar with but it does set the two choux together. Mix all of the ingredients until it becomes a homogeneous, sandy mixture in a bowl. Take two sheets of parchment or wax paper. Pour the above mixture onto one of the sheets and lay the other sheet on top of the mixture and press or roll down with a rolling pin to a thin sheet, about 1/4-inch thick. Place the topping (with the parchment/wax paper sheets) on to a baking sheet and let it set in the refrigerator. Preheat the oven to 375°F with the baking rack set in the middle of the oven. Take a saucepan, add the water, butter, and salt to heat until it just boiling then remove the pan from the heat and set it on a counter. If you are working with a stand mixer, turn up the speed to medium-high and let it mix for about a minute after a cloud of steam vacate from the bowl. (You don’t want scrambled eggs in your dough.) Add one egg at a time so the dough absorbs the eggs. The dough will look like it’s broken but keep letting the mixer run until it forms a smooth, thick paste. If you’re using the wooden spoon and pot method, keep on stirring the dough mixture until a fair amount of steam has vacated from the pot but the mixture is still quite warm. Add an egg at a time and quickly stir. The mixture will look broken but keep on stirring until it forms a smooth, thick paste. Pour/fill the choux dough into a 12-inch pastry bag. Twist and push down the choux. Take a pair of scissors and cut across the bottom of the pastry bag to make a 1/2-inch opening to pipe (about 1 inch from the very tip of the bag). Take a baking sheet lined with parchment or silicone baking mat and start piping 3 each of the 2-inch diameter and 4-inch diameter rounds. Remove the cookie topping from the refrigerator and use 2-inch round and 4-inch round cookie cutters to stamp out rounds. Place each cookie round on top of its respective sized piped choux. Lower the oven temperature to 350°F and place the pan of choux and let it bake for 25 minutes. Rotate the pan and increase the oven temperature to 420°F until it turns to golden brown, for another 10 minutes. Remove the choux from the baking sheet and let it cool on a cooling rack. While heating the milk, take a medium sized mixing bowl and add the vanilla paste (or extract), egg yolks, granulated sugar and cornstarch and mix. This the mixture will become a very thick yellow paste. Add about 1/4 cup of the heated milk to the yolk-sugar mixture and quickly whisk so the eggs would temper. The mixture would still be relatively thick. Add the remainder of the the milk and stir until it’s smooth. Pour the mixture back into the saucepan. Heat the mixture on low heat and continuously stir with a rubber spatula until the mixture thickens. Be careful not to bring this mixture to a boil or you would have sweet scrambled eggs. Combine the sugar, water and corn syrup in a medium saucepan. Stir well. Place candy thermometer into the mixture and place over medium-high heat. Let the mixture bubble until it reaches 238°F (soft ball candy stage). When temperature is reached, remove from heat and transfer the hot liquid to the bowl of a food processor fitted with a steel blade. Do not process yet! Clean the candy thermometer and insert into the hot syrup. Let cool to 150°F, about 35-40 minutes. Have a large bowl ready in which to pour the fondant. Also have ready a wire rack with a large jelly roll pan placed under it to catch the excess fondant that falls off of the cakes. When thermometer reads 150°F, add food coloring, then process for 2-3 minutes until mixture has turned from a clear liquid to opaque. Immediately pour fondant into a bowl for dipping. Give the fondant one quick stir, then repeat the process with another cake. Try to dip and spoon as quickly as possible. This fondant sets up quickly, so halfway through you may need to heat it in the microwave to loosen it up. Take the cooled choux pastries and take a paring knife and make a small pierce on the bottom of the pastries. Take the pastry cream and fill it with a piping bag fitted with a 1/2-inch round piping tip. Fill the pastries with the cream. Be careful not to overfill. 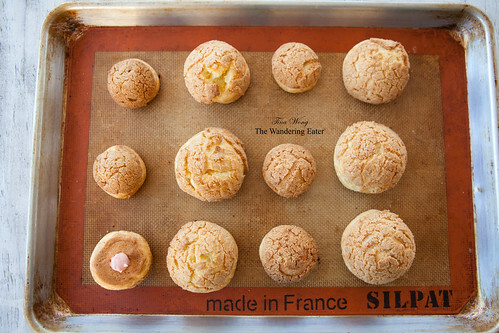 Work in a set of choux (as in a large and small sized chouxs), dip the large filled choux with the pink fondant and set it on a cooling rack with another baking sheet to catch the drips. Dip the small filled choux into the fondant and place it on top of the large fondant and gently press down on it so it would set. Let it dry for 5 minutes. It’s ready to eat. 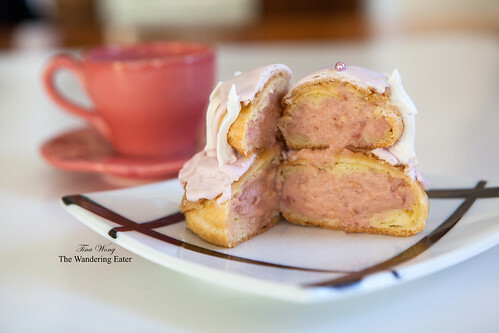 You could embellish this relgieuse like I have with silver dragees, top it with a fresh raspberry to indicate the pastry is that flavor and even pipe buttercream beads along the pastry. Nevertheless it’s delicious with or without them.